There are many ways to make money online, but let’s be real, they aren’t all rainbows and butterflies. I’ve tried tons of ways to make money, and this is one of my favorites. So, what is the Best way to Make Money Online? It’s called Respondent and you complete simple research studies that can make you some hefty side income! Step Two: Browse to find a study that seems to be a match. Step Three: Answer the simple questions to see if you qualify for the study. Step Four: You qualify! Now, a researcher will most likely contact you to choose a date to complete the study. Step Five: Meet online with the researcher on the chosen date. The study will most likely be done through a video chat or a voice chat. Step Six: Using your personal opinions and knowledge answer the researcher’s simple questions. Step Seven: You’re done! Get paid via PayPal in a few days. Learn more about Respondent here! You can make a hefty side income by completing these research studies. 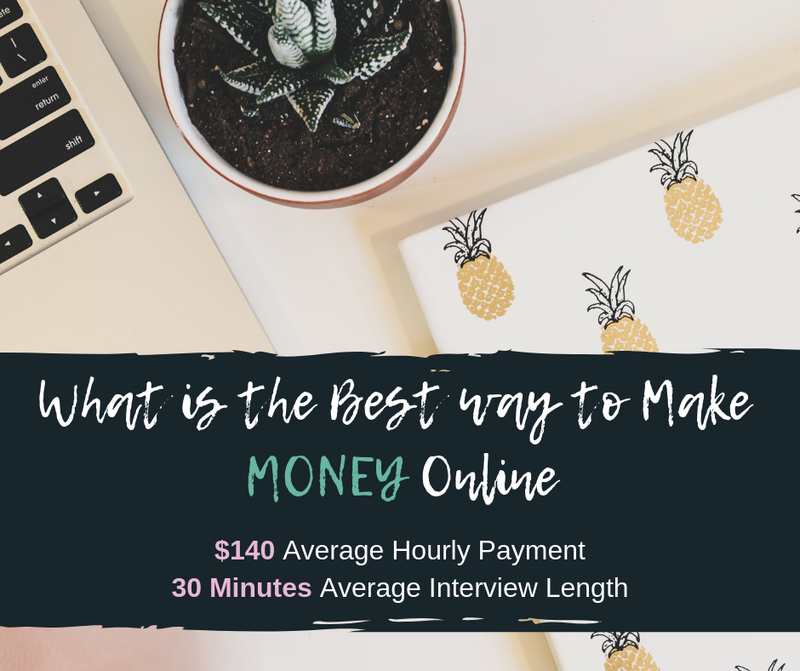 To give you an idea the average hourly pay is $140, and the average survey takes 30 minutes. That can really add up. If you qualify and complete about 3 studies a week, that can add up to approximately $1,680 a month. That’s why this is such a great opportunity for side money. I haven’t’t found anything else like this online, the great payout for the work completed, is amazing! Most of the research studies can be completed on a desktop of laptop computer. The majority of the studies accept both Mac and PC users. I have completed a couple studies using my smart phone. There aren’t as many studies where you need a smart phone, but there are some. Usually you will need to download the Zoom app. If the study is done on your laptop you will need to follow the link the researcher sends you. The link usually takes you to a Zoom meeting. These meetings are easy to understand, and you don’t need to have technical experience. All in all you will most likely need a laptop or desktop, and sometimes a smart phone. Most of the research studies will need to be completed remotely in a quiet area. This can be done at your home in a room with little noise. I usually take my laptop into my bedroom or office to complete the surveys. You don’t need an office though. Almost always you cannot complete the studies in a public place. Don’t expect to go to a cafe, because the noise level will be way too loud and distracting for the researcher. Anyone can sign up for Respondent! You just want to make sure you verify your account. It helps to fill in your profile. You will only be able to participate in the studies you qualify for, and are asked to participate in. But, anyone can sign up! Look for studies that seem to match you the best, and see if you qualify. Okay, Does this Cost Money to Join? No! You will pay NOTHING to join Respondent and to participate in studies. Earn Some Easy Extra Income! If you’re someone who is looking for a simple way to make some extra money, this is a great place! It’s a nice side hustle for anyone interested in answering some questions to help with research. The studies are easy to complete, as you just have to use your own opinions and thoughts. I love Respondent because the studies are fun, quick, and the pay is great! In my opinion, it can’t get much better than that. I’ve signed up for typical survey sites, and they just don’t cut it. You sign up to fill out a never ending annoying survey, and then you never know if you will actually get paid. These research studies are not like that. The structure of the site is wonderful, and you will always get paid for your completed studies. The process is straightforward and simple. I find this side hustle to be entertaining, and you might too! All you have to do is find research studies you qualify for, complete the survey, and get paid. It truly is a fun and simple process! You will find that the surveys don’t take up much of your time and can be done in the comfort of your own home. Plus, the money can be hefty. You will find Respondent to be one of the best ways to make money online! Check out more about Respondent here! If you have any questions, I’m happy to answer them below! 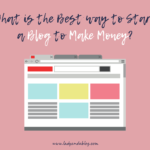 More interested in starting a money-making blog? Check out this article! Previous Previous post: What is the Best way to Start a Blog to Make Money? 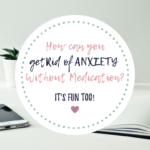 Next Next post: How can you get Rid of Anxiety Without Medication? – It’s Fun Too!